Daphne d'Offay at Ocean Independence has been appointed central charter agent of the 48.5m motor yacht Audacia, available in the Mediterranean this summer. Built by Feadship in 1987, Audacia had an interior refit in 2007 and further works in 2011 when she was extended to 48.5 metres and Quantum zero speed stabilizers were added. Her classic contemporary interior has honey coloured teak panelling with six guest cabins full of charm and character. 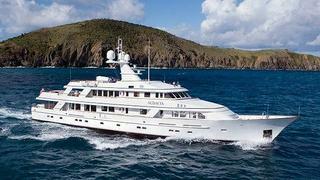 Audacia is available for charter at weekly rates starting from $190,000 in high season and $170,000 in low season.